And I start each day with Jesus. Inscribing the Word has been life-changing for me in my walk with the Lord. Started in July of 2016, tens of thousands of men, women, children, and families are now Inscribing the Word with The Felicity Bee this month. As with most exciting new adventures, we wait for January 1, or a Monday, or a new season to begin. But don't put your time with God on hold as you wait for the next Monday or the upcoming New Year. Get with the Lord today; right now; at this moment. If you just stumbled upon us . . . WELCOME! We'd love for you to start Inscribing the Word with us today. If you have fallen behind in your Bible Study time . . . WELCOME BACK! It is never too late to start. The Word is waiting for you. This January of 2018, we began the year by inscribing 1 John. 1 John centered us and brought back to mind, "the things we learned from the beginning." 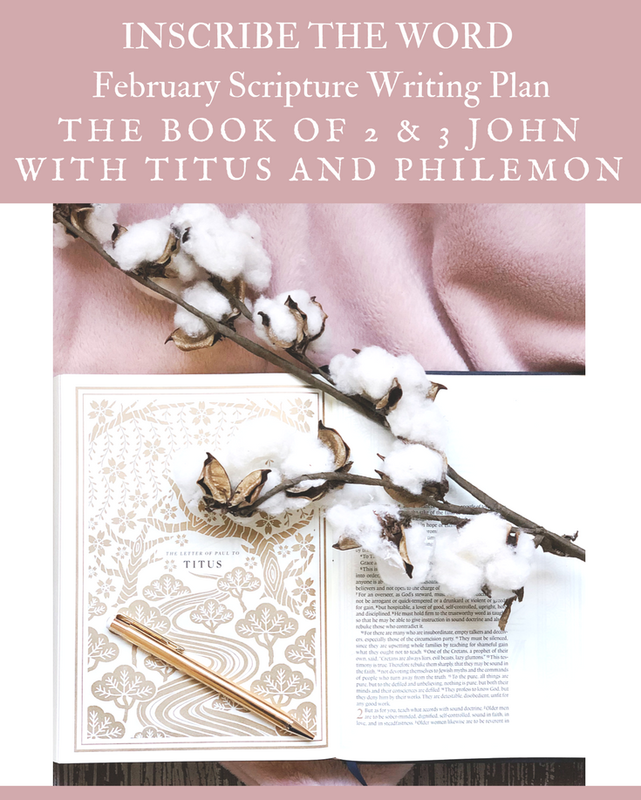 (1 John 2:24 and 1 John 3:11) This February 2018, we are naturally finishing John's epistles with 2 and 3 John as well as Titus and Philemon. I know that sounds like a lot, but my goal this year is to Inscribe as many New Testament Epistles as we can! So here we go . . .
Let us take a look at the book of 2 and 3 John so that we have a firm grasp on its origins before we start writing it out. Author: The author of 2 and 3 John is the apostle, John. The beloved disciple of Jesus and the author of the Gospel of John as well as 1 John. When and Where: 2 and 3 John were most likely written in Ephesus between A.D. 85 and 90. He wrote all of the epistles with his name from Ephesus. * 2 John was written to "The elect lady and her children," as well as to Christians everywhere. This woman and her family were most likely involved in one of the churches that John was overseeing. They had apparently developed a strong friendship with John. * 3 John was written to Gaius, a prominent Christian in one of John's churches as well as to Christians everywhere. *John wrote 2 John to once again warn against the false teachers plaguing the church. He wrote to re-emphasize the basic of Christianity - truth, and love. * He wrote 3 John to commend Gaius for his hospitality and to encourage him, and Christians everywhere. Now, if you will, journey with me to the book of TITUS. Let us observe some of the key facts before writing out this compelling book. Author: The author of the book of Titus was Paul. When and Where: Titus was written around A.D. 64. Titus was written either from Macedonia or Nicopolis. Written To: Paul wrote this epistle to Titus, and to believers everywhere. Titus was Greek and was most likely a convert through Paul's ministry. He had become Paul's representative to the churches on the island of Crete. Why: The purpose of this epistle is to advise Titus of his responsibility in supervising the churches on the island of Crete. We finish this month's Inscribe the Word in the Book of Philemon. Let's take a look . . . Author: The author of the book of Philemon was Paul. This is one of three personal letters in the Bible. When and Where: Philemon was written about A.D. 60 during Paul's first imprisonment in Rome, at about the same time Ephesians and Colossians were written. Written To: Paul wrote this epistle to Philemon. Many scholars believe that Philemon was a wealthy member of the Colossian Church. It was also written to believers everywhere. Why: The purpose of this epistle is to demonstrate the power of Christ and of true Christian fellowship in action as Paul pleads with Philemon to accept back his runaway slave as a brother. I pray that as we continue with the Epistles of the New Testament, that you begin to recognize the false teachers of our day. I pray that you start to "remember what you were taught from the beginning." Join us this year and make a commitment to Inscribing the Word. Join us with your families and Inscribe the Word together. Our children's plan is available for download below along with our adult plan. 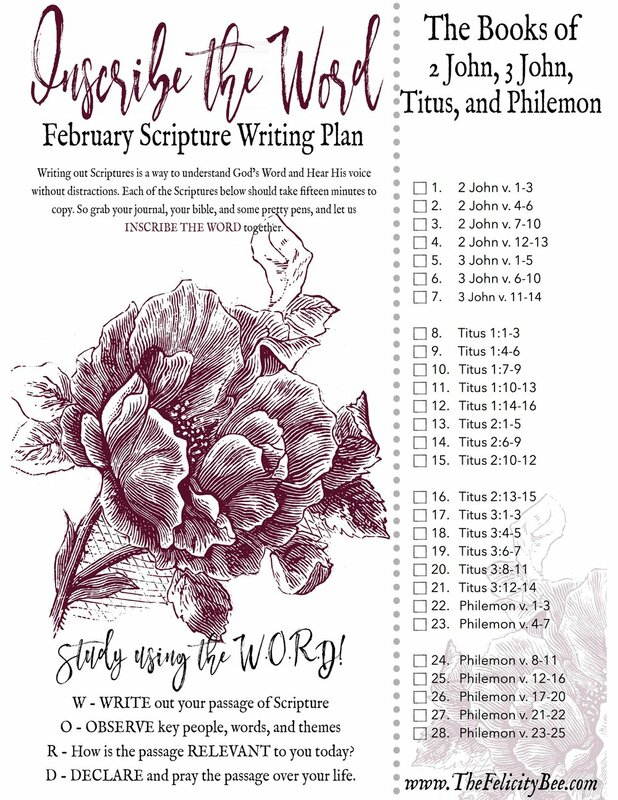 CLICK HERE to download Your February Scripture Writing Plan! 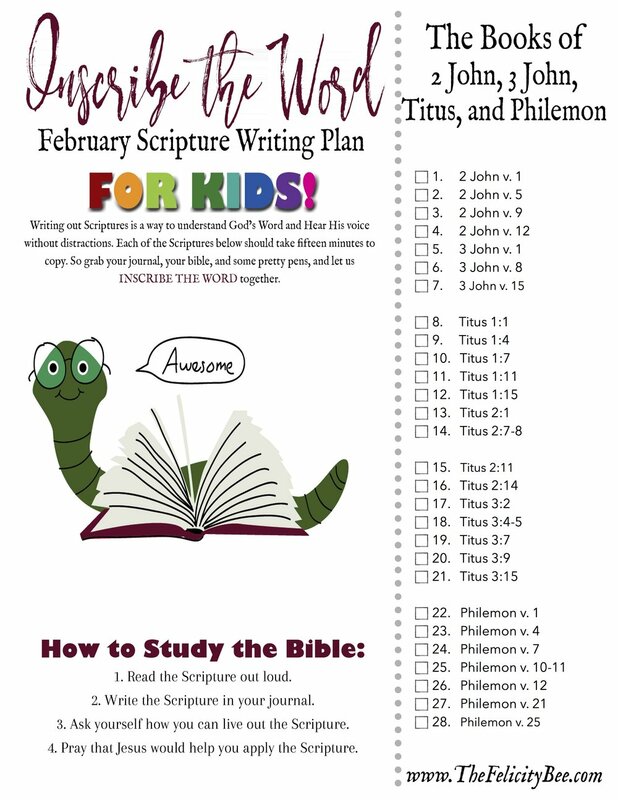 Click here to download your february Scripture writing plan for kids! 365-Day Inscribe the Word Journal.